It's been less than a week since Unity 2018.1 left beta, and yet we're already treated to a preview of 2018.2 with a public beta! Awesome time to be a Unity user, eh? Before I go over what's new and exciting in this preview build, one thing in particular did catch my eye: High-DPI scaling support! Long live the mighty 4K (not to mention 8K) monitor. It's been a while since Unity 2018.1 entered beta, and if the list of features, changes, additions, improvements (and so on), are any indication, this one's definitely been worth the wait; even if certain bits were also part of the beta. Twelve days into the new year, and we already have a public beta of Unity's upcoming 2018 iteration? So groovy! I mean, it's not exactly overflowing with new stuff - beta being beta - but that doesn't matter. What does however... is that it's here. Right now. No waiting until, I don't know, summer or fall. New Unity! Yeah! (Just remember, beta build). As anyone with a calendar handy can tell, 2017 still has several months in it, and yet here we are, Unity preparing their annual celebration of recently released projects made with the popular engine. There's method to the madness though: the 'recently' bit in this case actually refers to projects that came to be (as in, made publicly available) during the 2016-2017 school year (October 1, 2016 to August 31, 2017). Some pretty groovy awards up for grabs too, and not just for the game dev folks either. As time goes by, software - and hardware - changes. Sometimes it's minor stuff, things most are unlikely to even notice. Not quite so for the release of Unity 2017 though, as this is a pretty big deal, and one that'll have quite the impact on video game development as a whole, given the popularity of this particular engine. Oh, and it's also the first step on the road to (finally?) deprecating Direct X 9. Little under four months ago, Unity 5.6 hit beta. As I mentioned back then, it would be the last 5.x build. Ever. Replacing it? Unity 2017, which is almost ready for a beta release, and boy is it ever looking groovy - even if only a tiny portion of its feature list has been revealed at this point. 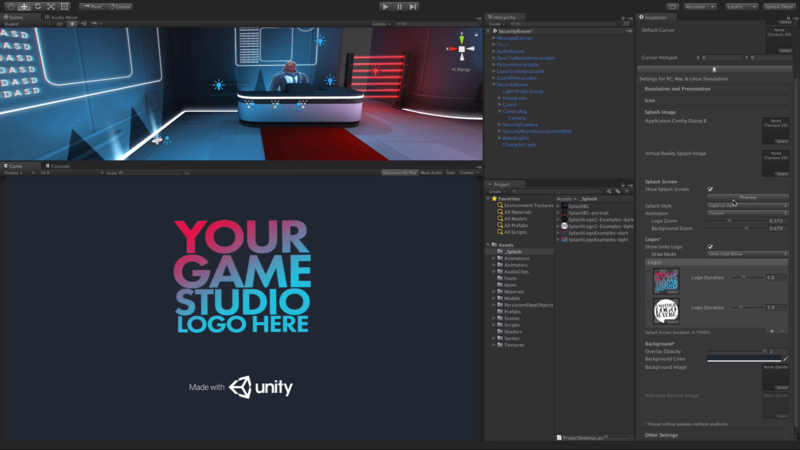 While hardly the most exciting thing to join Unity's toolbox, I have a feeling there are still plenty out there who are more than a little eager to customize the splash screen of their project. This one's for them. Shame that most people go out of their way to skip said screens, but ah well, what can ya do? Back in March, Unity 5.4 entered beta, and now… it's out of beta. In just a few months! If only certain indie games had equally brief betas, eh? Right. Anyway, this update brings some genuinely great stuff, while at the same time, abandoning support for a certain console and OS revision. Oh and Web Player is dead. Long live WebGL. Feels like only yesterday when Unity 4.6 ditched the beta tag, and now here we are, less than six months later, the release of Unity 5.0 upon us. Great time to be a developer for sure. Even more so, since this version - among other things - brings a brand new business model; Professional (monthly subscription) for large studios, and Personal (free) for smaller teams.